A blaster that's as effective as it is pretty. With today’s solar eclipse hitting the headlines, Prime Time Toys has taken the opportunity to promote the Light Command. 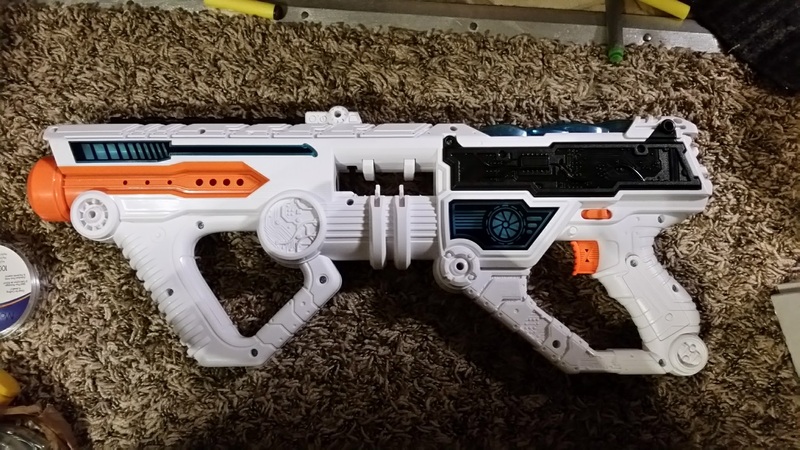 As such, I figured I would review the blaster and give my thoughts. While I did receive one in the mail for review, I also went out and bought a second one for my collection. That alone should tell you that it’s a great blaster. But don’t just take my word for it – look at the pretty pictures and info! This thing looks good. Seriously good. The combination of white body, orange and blue accents, and lights is what the Nerf Doomlands Impact Zone line should’ve done. Plus the LEDs are relatively bright, even in daytime. You’ll be glad to know that the lights operate on two AAA batteries, separate from the 6 AAs that run the motors. So if lights aren’t your thing, or they’d just give you away, you can always leave the batteries out. The shell plastic is solid and feels great, with plenty of texture. In addition, both grips (front and back) are spacious and comfortable. The chains complete the look, although they may be an instant turnoff to some. Yes, magazines are the standard in foam dart blasting. But in terms of fun, chains always have a place. Taking the shell apart is easy, after the removal of the screws. Interestingly, the LEDs in the left half of the shell have a simple disconnect, allowing complete shell separation. The engineers at Prime Time Toys retained the same internal design as the Scorpion and other chain-fed flywheel blasters. Two flywheel motors, one pusher motor that also turns the geared rotation mech. 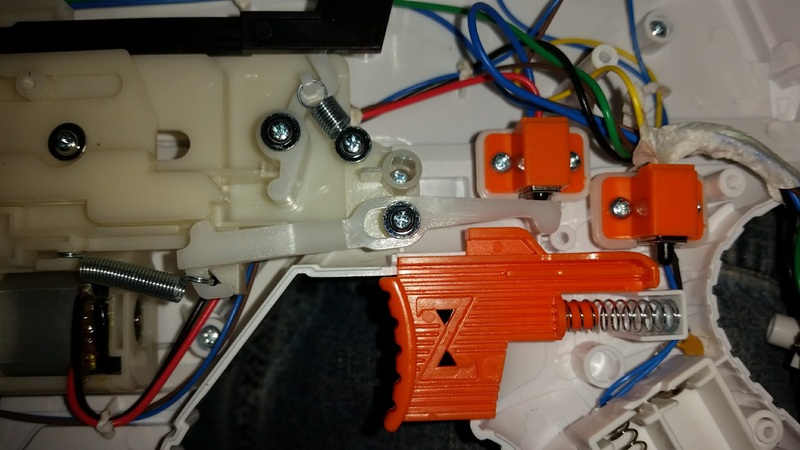 The wiring on the printed circuit board, where the blaster “ON” switch resides. 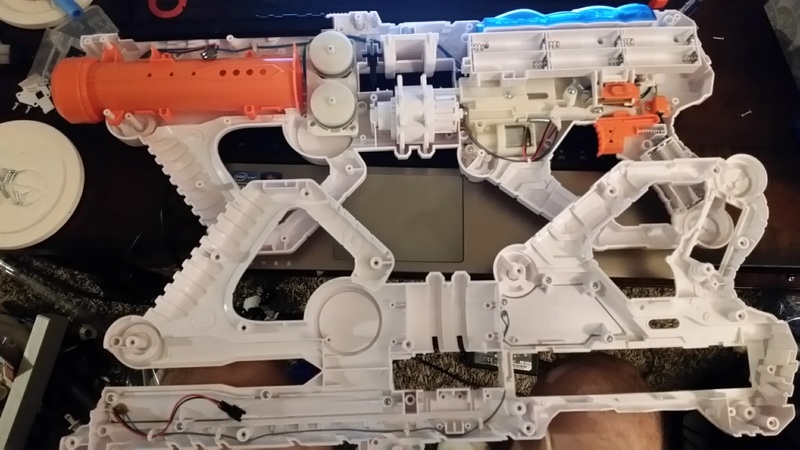 In order to accommodate two voltage sources, the blaster uses a DP3T switch that connects three of five contacts at any one time. 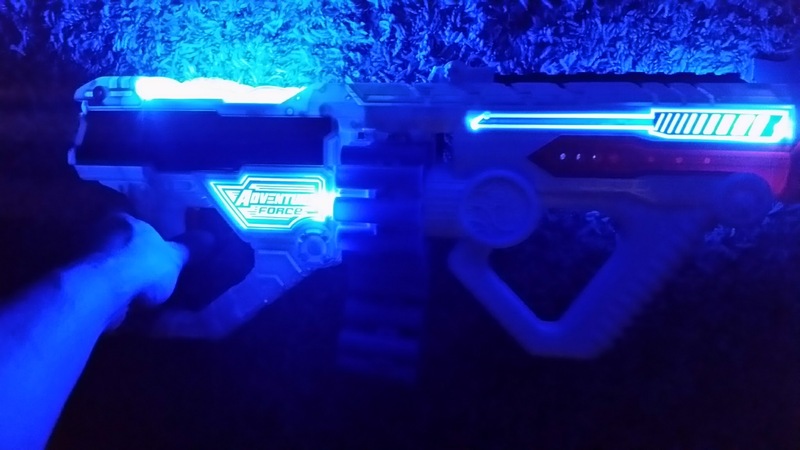 This allows the blaster to have a lights-only mode before fully turning on the blaster. 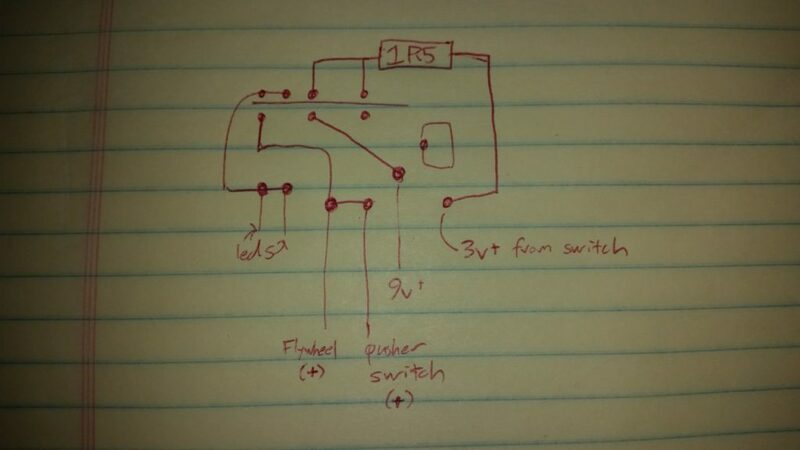 In addition, the engineers managed to eliminate a limit switch with the use of a floating lever between the trigger and pusher motor switch. When the pusher mech is in its cycle, the lever remains in the tripped position, regardless of the user holding the trigger. The floating lever, depressed at the beginning of the pusher’s cycle. If you watch Youtube Nerfers at all, you may have seen some reviews where people had a dart fire as soon as they turned the blaster on. That’s due to the pusher mech being just far enough along to keep the electrical switch depressed. The lever is actually shaped to prevent this from happening, as it has a notch to lock the pieces in place. So why does it do this? Turns out the flywheel motors are to blame. Or, rather, how they’re wired. Motors act as generators when you cut the power; their residual rotational energy gets converted back into electrical energy. If you happen to pull the trigger while the motor shafts are still in motion, you actually complete the circuit by connecting them to the pusher motor, and they have enough residual power to make it turn slightly. Pulling the trigger when the blaster isn’t on isn’t something you’d normally do…unless there’s a light-up mode encouraging that exact thing. Just something interesting I found! The Light Command ended up being one of the most consistent blasters I’ve come across, in terms of dart velocity. Virtually all darts I tested (the included Super Darts, Nerf Elites, Accustrike, etc) tested in the low 90s in feet per second. So consistent, in fact, that I’ll be using it for part of my upcoming dart comparison. Because it’s easier to observe dart flight characteristics if everything starts at roughly the same speed. Who knew? In addition, the blaster is firing three darts per second. That’s plenty fast enough for sending darts toward your target. 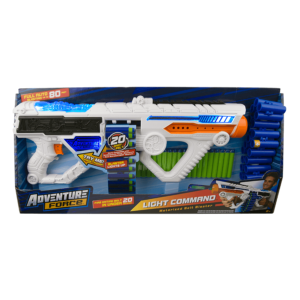 The Adventure Force Light Command is an amazing deal at $25. It maintains all the functionality of the Dart Zone Scorpion, but in a larger and easier to wield package. It looks great, feels great, fires great, and works beyond all expectations. Be sure to stop by your Walmart (home of the Adventure Force line) and grab one. Just think of the extra lights as icing on the cake! 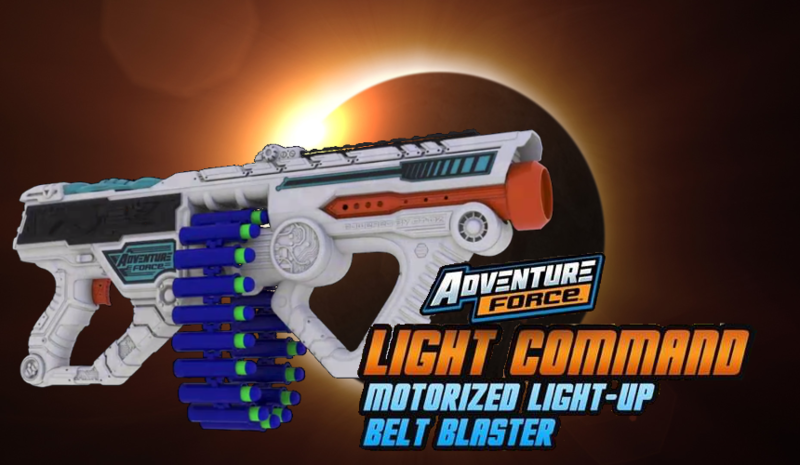 This entry was posted in Blaster Hub: Recommended, Dart Blasters, Reviews and tagged 2017, adventure force, dart zone, light command, prime time toys, review on August 20, 2017 by BuffdaddyNerf.